UPDATE: Read T3's full Samsung Galaxy Tab S4 review. The Samsung Galaxy Tab S4 is the successor to the Galaxy Tab S3. This new Samsung tablet has a larger screen, longer battery life, a new speaker system, and - most importantly of all we think - built-in Samsung DeX functionality. Here is everything you need to know about Samsung's new Tab S4 tablet. The Samsung Galaxy Tab S4 starts at £599 in the UK. The new Tab S4 will be available for purchase on August 10th starting at £599.99 for the WiFi enabled model, which is the same figure as Apple's 10.5-inch iPad Pro and in a similar ball park to Microsoft Surface. There is also going to be an LTE model of the Tab S4. This is priced at £649.99. The Tab S4's new keyboard case retails for £119. The tablet will be available to buy on Samsung's online store, Amazon, and Best Buy in the US. The Tab S4 features a 10.5-inch 2,560 x 1,600 screen. 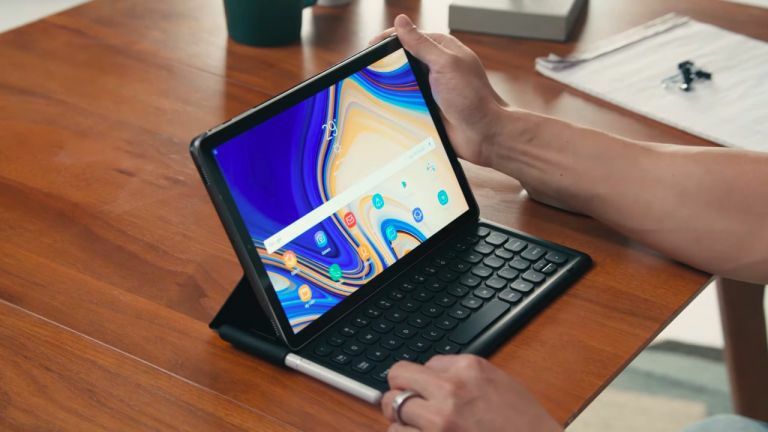 The Samsung Galaxy Tab S4 packs a 10.5-inch Super AMOLED 16:10 screen with a resolution of 2,560 x 1,600, which is larger overall than the 9.7-inch display installed on its predecessor, the Tab S3. There are relatively thick bezels around the frame of the Tab S4, and in the top there is an 8-megapixel camera on the front. On the rear of the tablet a 13MP camera with autofocus and LED flash can be found. This camera is capable of recording video at a 4K resolution up to 30fps. Internally, the Tab S4 comes loaded with a Qualcomm Snapdragon 835 processor and 4GB of RAM. Two storage configurations are available, a 64GB model and a 256GB model. However, space nuts need not fear too much here as storage in both models can be expanded via the tablet's built-in microSD card slot up to an additional 400GB. The tablet is charged via a USB-C port, while Bluetooth 5.0 functionality is also available. Speakers are tuned by audio company AKG. In terms of battery life the Samsung Galaxy Tab S4 comes with a large 7,300 mAh battery, which is a marked improvement of the Tab S3's 6,000 mAh. Samsung states that this new battery will grant the Tab S4 16 hours of video playback between charges. In terms of audio, the tablet has four speakers that fire out of the system's sides. These speakers are tuned by audio company AKG and support Dolby Atmos Sound. The S Pen included with the Tab S4 is not the new, Bluetooth-enabled one coming to the Galaxy Note 9, but it does support Air Command, Screen-off Memo, Live Message, and Translation features. DeX allows for a light computing experience. Samsung DeX, for those who are unware, is the South Korean company's tech that allows for a tablet or smartphone experience to be transformed into a light desktop computing one. It was first introduced in the Galaxy S8. DeX on the Tab S4 is designed to work with the tablet's new $149.99 Book Cover Keyboard Case, which once attached to the tablet automatically switches the system out of its standard icon-based tablet mode, and into a computing-focused DeX mode (these modes can also be manually flipped between). Once in DeX mode, the tablet portrays PC desktop-style user interface, and through a variety of apps optimised for it, then allows the user to enjoy a laptop or hybrid-style experience, with re-sizable windows, right click options, and drag and drop functionality. An S Pen comes in the box for free. Samsung has unveiled a device that looks set to sit right between a work and play device, offering a competitively priced tablet that can compete with both Microsoft's Surface range of systems (but specifically the Surface Go), as well as Apple's iPads. In many respects it feels like a iterative evolution of the Tab S3, offerinng a similar looking device but one that manages to be better and deliver more across the board. The battery and screen is bigger, while the cameras and internal hardware more powerful than before, with the expandable microSD card slot adding in welcome storage space potential, too. The real BIG inclusion though is in-built Samsung DeX. This makes the tablet appear to be a legitimately good working device as well one for playing, and could be a game-changer. Be sure to check back in soon for T3.com's full Samsung Galaxy Tab S4 review. Samsung is unveiling a new product today at 4PM BST (8AM PST). It's definitely a new tablet and it's probably the Samsung Galaxy Tab S4, given that the last one was called Tab S3. No official confirmation is yet available, but come on, we're all adults here. "All new tablet coming soon. Watch the online unveiling here. Video starts on August 1st 2018, 11AM EST." Well, that's quite clear then. Samsung IS unveiling a new tablet, although if it will be called the Galaxy Tab S4 is still unconfirmed. We would be surprised to see the Galaxy Tab naming scheme abandoned, especially in light of the fact that the Samsung has extended the branding to its Galaxy Watch, and the Galaxy Note 9 flagship is also scheduled to be unveiled in just over a week. The big event kicks off in under an hour now, and can be watched directly on Samsung's website, too. We'll be watching and will update this article when new facts about this new tablet, called either the Galaxy Tab S4 or Supertablet 9000, emerge at 4pm today. Using our journalistic skills, we can confirm that is less than one hour from now.